The largest St. Petersburg Helly Hansen National Offshore One Design (NOOD) Regatta in 10 years got underway Friday with 170 boats and more than 500 sailors racing on Tampa Bay in optimal conditions ranging from 8 to 12 knots. In the Melges 24 class, one of the largest fleets in the event, Monsoon tactician Mike Buckley credits his team’s Day 1 lead — with three first-place finishes in four races — to conservative sailing and a little luck off the starting line after the first race. “The first race was really tricky; there was light wind and the two boats that beat us did a better job transitioning and maneuvering,” Buckley said. But when the breeze came in, team Monsoon had three solid starts and were able to keep the rest of the fleet behind for the duration of the race. Another of the big fleets on the water is the A Class Catamarans (known as A Cats), speedy one-person multihulls with a passionate community of sailors who typically only participate at the St. Petersburg event of the Helly Hansen NOOD Regatta circuit. 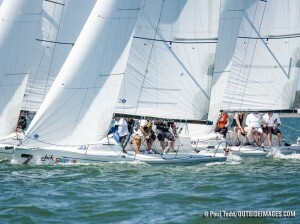 Ben Hall, a longtime class leader whose La Femme Nikita is his 28th A Cat, is currently leading the competitive fleet after four second-place finishes. Recently retired, Hall sails in the fleet’s tamer Classic division rather than the contemporary foiling group, which feature hydrofoils that lift hulls out of the water to increase speed. “I’m going better upwind than I have in the last 10 boats,” Hall said, referring to his newest boat’s design and equipment. In addition to having more time to “making little tweaks to the boat, go sailing for a couple hours, then change something else,” Hall attributes his success to an active lifestyle and constant learning. The regatta’s largest fleet is the popular J/70 class, which is headed up by Brian Keane and his crew aboard Savasana after four races.